Along with the news about Interpol chief’s disappearance in China, yesterday’s news about Khashoggi indeed point to an “abysmal new low” in the international system; the emergence of a new type of “transnational banditry” led by autocratic states. 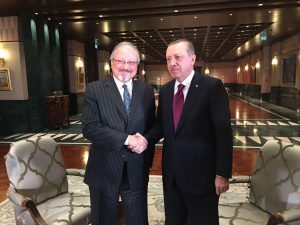 Unfortunately, Khashoggi fell victim to some new alarming international norms that the regime he supported, that of Erdogan, also helped to establish for the last couple of years. It is not a coincidence that he was not abducted when he was visiting Saudi consulate in the US, but in Istanbul. This incident would be quite unlikely in the US. He said to his Turkish fiancée before entering the building, it was “unlikely that Saudi officials would risk angering Turkey by detaining him” but he made a misjudgment about the rules of the new game he was somehow part of. Because this was taking place when transnational abductions have actually become the new Turkish policy in the region, or more broadly the policy of all these small evil regimes mimicking the Chinese and Russian regimes. If Turkey has been abducting the dissidents from the Arab countries, Afghanistan, Malaysia, Qatar, sometimes even without the knowledge of the country’s leaders, as it happened in Kosovo, with impunity and even without any real international reaction, then why would not MBS take this to the next level to try an “enforced disappearance” in his Istanbul consulate? It is now free for autocratic regimes to threaten the dissidents everywhere by abducting them, harming them, and now even killing them, on foreign soils. Just last week a German police officer of Turkish origin was arrested for spying on behalf of Turkish regime by collecting intelligence about Turkish dissidents, and passing it onto the Turkish embassy in Berlin. Apart from the reports of assassination attempts against dissidents in Germany by Turkish-led bandits there, there was a time we, dissidents, literally discussed to what extent Turkish government could go to harm us in the consulates. I don’t think they are considered safe for dissidents any more even if they are in the EU territory. This is the new low we are in, and unless we all do something together about these nasty, evil regimes, whether Turkey-Qatar-Iran, or Saudi-UAE-Egypt axis, without any exception, without favoring any one of them over others, we will all pay for it at one point or another.